Any file can be sent to At Your Service Software, Inc. using the At Your Service – Database Repair Utility. All customer data sent to At Your Service Software, Inc. is always kept completely confidential. It is only used for internal troubleshooting purposes, and is never passed on to third parties. Step 1: From the Windows Start menu, select At Your Service > Utilities > Database Repair Utility in order to run the At Your Service – Database Repair Utility. In Windows 8.x and 10, if you do not see the Database repair utility on the Start screen, you may have to click the down-arrow at the bottom left to see all programs. You may also type “Database Repair Utility” when viewing the Start screen to search your installed programs. 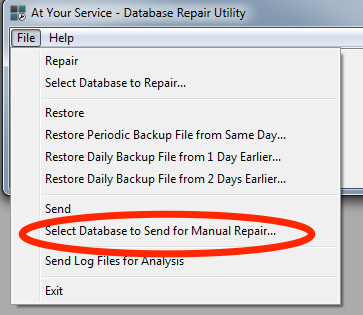 Step 2: Within the Database Repair Utility, select File > Select Database to Send For Manual Repair from the main menu in order to open the file selection window. Step 3: If you need to send a file type that is not a .ays database file type, then click the dropdown for the Files of type field and select All Files (*.*). Step 4: Browse to the folder where the file exists that you wish to send, select the file, and click the Open button. The file will then be sent automatically to At Your Service Software, Inc. via FTP behind the scenes. A message will be displayed once the file has finished sending. If e-mail is set up on the computer, then an e-mail message will be sent to At Your Service Software, Inc. that the file has been sent. How do I send a Microsoft SQL database to AYS? How do I view a log file?